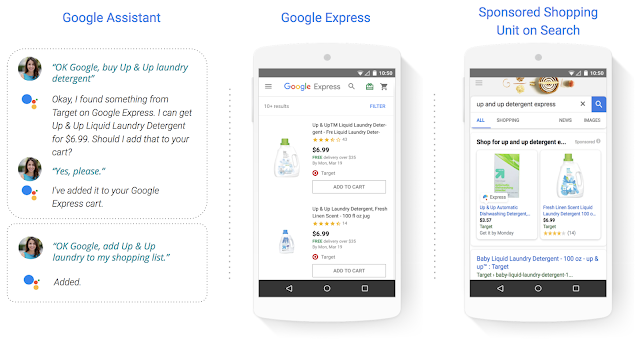 Shopping Actions is a new Google service that will allow users to purchase items on Google search, the Google Express shopping service, and Google Assistant on home devices and mobile. It avails shoppers an easy way to purchase from retailers with instant checkout by saving their payment credentials and as a “seamless shopping" experience. Unlike other Google ads, the Shopping Actions service charges on a cost-per-sale model, while Google earns revenue from sales generated from these placements. Google maintains that the listing won't impact organic rankings or change anything in response to speculation that preferential ranking would be given to those merchants on the service. Albeit, this is perhaps Google’s latest attempts to regain ground from Amazon in consumer product searches, as the service mimics Amazon's offerings like: one-click re-ordering, voice-enabled shopping that is enhanced by purchase order history, and instant checkout using saved payment credentials. The early adopters of the service are companies like Target, Walmart, Home Depot, Costco Wholesale, 1-800-FLOWERS, and Ulta Beauty who signed on for the test run of the program. And the program is currently restricted to US retailers, and will spread to more countries as the service gains more traction. Google has promised to integrate shoppers Google accounts and retailers', to create a more personalized and intuitive shopping experience. To learn more about Shopping Actions, sign up through this Google form to be contacted with more information.